"Turning Piratez into Consumers Using Multiscreen For Digital Video"
Want to stop content piracy? 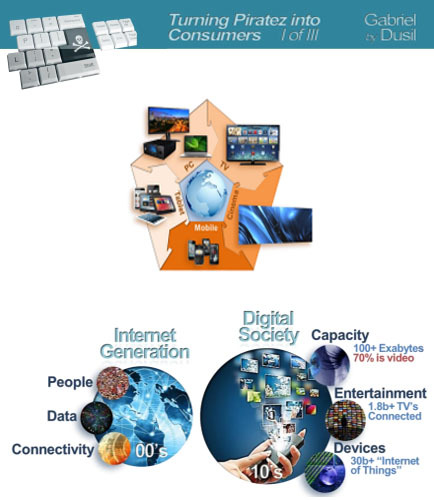 Multi-screen is at the top of the entertainment industry’s agenda for delivering digital video. Many in the entertainment industry are quick to blame piracy for any revenue decline in their business. But why not blame the Internet itself? What are the origins of digital piracy and what are the methods that have been developed to halt its progress? What is the role of social media in piracy and the entertainment industry? What are the issues surrounding piracy and content protection, in the form of a gap analysis about what consumers want from their entertainment? Read this whitepaper to learn about the new trends in multi-screen and the privacy related challenges that solution providers are facing today in assisting curators of content to address their content aggregators and distributors’ needs and changing market demands.